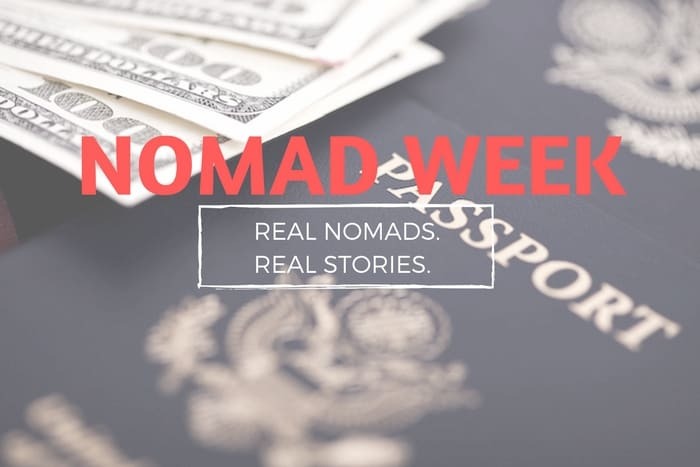 Welcome to Nomad Week, a ten part series revealing the adventures, knowledge and travel tips from experienced digital nomads located all across the globe. I recently reached out to some of the best in the industry to get their perspectives on world travel and the digital nomad life. This week we share their stories with you. Real nomads. Real stories. Find all ten interviews here. Erin McNeaney and Simon Fairbairn are a digital nomad couple who sold everything they owned and left the UK in 2010 to travel the world forever. They write about their slow travels around the world, the delicious vegetarian food they eat, and the ups and downs of nomadic life at NeverEndingVoyage.com. They are the creators of the iOS app Trail Wallet, which helps travelers stay on budget. What’s your favorite thing about the city? Berlin is a popular digital nomad hub so it’s easy to meet other digital nomads and we know lots of other travel bloggers who are based here. There’s always something going on from refugee street food festivals to art gallery openings. And the many parks are great for relaxing on sunny days. Berlin is also a very vegetarian and vegan-friendly city with a diverse range of food available. What’s your LEAST favorite thing about the city? I prefer smaller, walkable cities and find Berlin to be too big. Public transport is good though and it’s bike friendly. I also don’t find the architecture of the city very attractive. Where is your favorite place you’ve ever lived and why? Ubud in Bali is our favorite digital nomad destination. We love the lush tropical vegetation, the bright green rice paddies, the fascinating culture with many temple ceremonies, the amazing vegetarian food scene, and the many yoga classes. It’s also an inexpensive place to live. I don’t know anywhere else where we can afford to rent a comfortable two-bedroom house with a private pool and amazing view. What is your LEAST favorite place you’ve ever lived and why? Medellin, Colombia didn’t live up to our expectations. We found it difficult to eat out as vegetarians and we just didn’t really connect with the city. I think it’s more popular with single males who enjoy the nightlife, but we’re not interested in that. What was the EASIEST country you’ve ever visited (i.e. easiest immigration, easiest to open a local bank account, etc)? As EU citizens anywhere in Europe is easy for us as we don’t need a visa, and we regularly return to Italy. In over six years of traveling we’ve only been robbed once when Simon was pick-pocketed on a bus in Costa Rica. He lost his wallet but it didn’t have much in it as most of his valuables were in a money belt under his trousers, which we wear on travel days. Do you prefer one region of the world over another, and why? We tend to spend the summers in Europe as we love the food, history, architecture, and ease of getting around by train. In the winter we alternate between Southeast Asia, which we love for the food, culture and low cost of living, and Mexico/Central America for a change and because we speak decent Spanish. Is there anything that would make you settle down and stop traveling as much? We have no plans to stop traveling. I suppose the only thing that would make us stop is illness. If you were coaching a new nomad, what would you recommend they do to get started? Before you leave home, save up as much as you can and ideally get your business off the ground and start earning some income. What country would you recommend a new nomad go to FIRST? What is one country that you have not been to but is high on your list, and why? South Africa for safaris and amazing scenery. We’re planning to go in January. What was the biggest mistake you made that other nomads can learn from? We originally had the idea for our travel expense tracker app, Trail Wallet, in our first year on the road, but it seemed safer for Simon to stick with doing freelance web design work as the income was guaranteed. He didn’t create the app until three years later. He enjoys creating his own products much more than doing freelance work and wishes he had taken the risk and made the app earlier. How do you meet new people while living the nomad lifestyle? Do you ever get lonely? Most of the people we meet are other digital nomads or travel bloggers that we’ve met online through our blog. There are people we’ve met up with on four continents and are now close friends. We don’t get lonely as we travel as a couple and don’t feel the need to be sociable all the time.